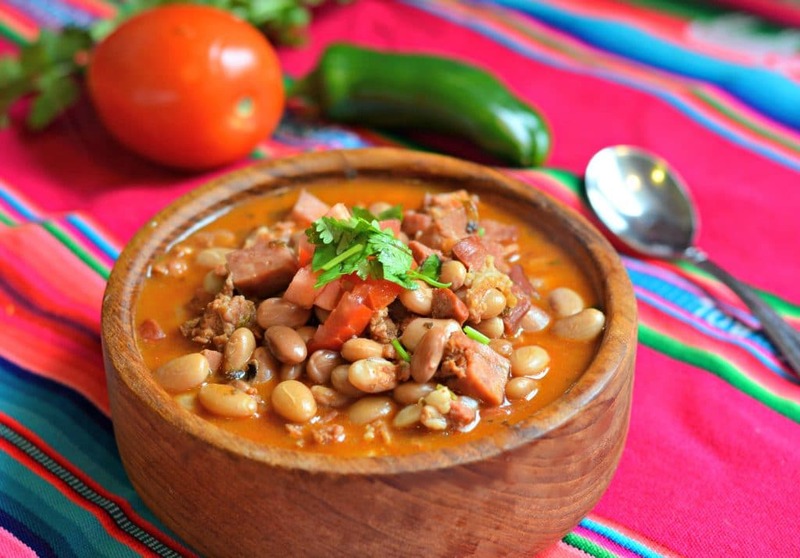 Charro beans is basically a Mexican style soup, consisting of pinto beans submerged in a broth full of amazing flavors that come from many different types of meat like beef franks, chorizo, ham, and bacon. In some parts of Mexico they add pork rinds and beer to change the flavor up a little bit. Even though the most popular way to make this is as a thinner soup, there are some other variations in which you can add corn starch to thicken it up a little bit. If you choose to do that, it ends up looking more like chili con carne, which is a popular dish here in the United States. 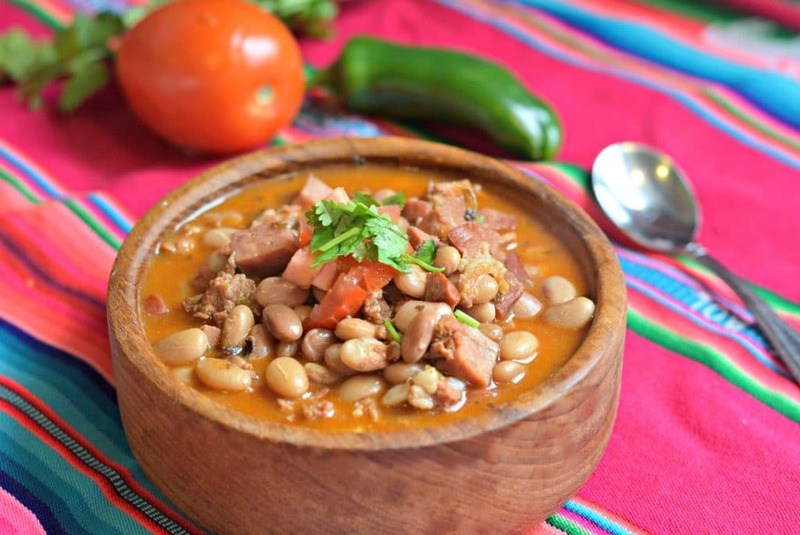 Charro beans are an excellent option to go along with any type of grilled meat and also tacos. 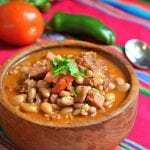 Just like I love eating pozole on cold days (which we have a lot of here in Colorado), I also love enjoying charro beans on those days as well. You can add some heat to it by including chipotle peppers or jalapeños together with the tomato, onion, and cilantro. One tip that I will give you in order to make this recipe a little bit easier is to cook the pinto beans in your slow cooker. Since you are starting with uncooked beans, you have to cook them separately first before adding the rest of the ingredients. If you do this in the slow cooker, it will still take some time (around 3 hours), but it is easier than having to cook them over the stove and making sure that the water doesn’t evaporate. It will also allow you to get started on the other parts of the recipe without worrying about the beans. Slow Cooker: You don’t have to use a slow cooker to make these, but you definitely can. I love this slow cooker – it works perfectly and I use it many times per week. 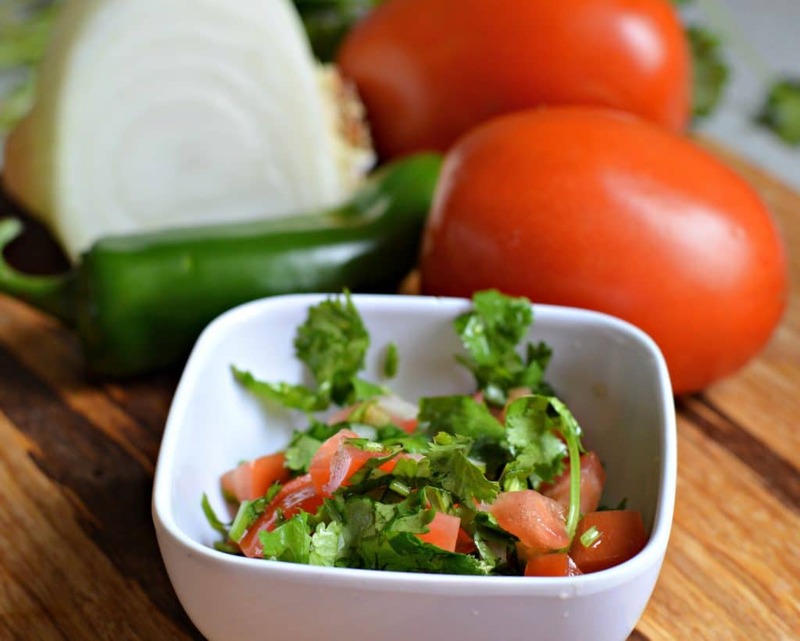 Food Chopper: When you are going to chop up a lot of vegetables like you do for the pico de gallo that you serve with these charro beans, it is helpful to have a food chopper like this one on hand. It seriously makes everything so much easier! Pinto Beans: You are going to need a lot of pinto beans to make this recipe. You can find bags of them anywhere, including online. When I make Charro Beans, I tend to make a lot of extra beans so that I can eat them in other recipes throughout the week. Here is a 25 pound bag if you are looking to stock up. Serving Bowls: There is something about charro beans that always makes me want to serve them in these rustic looking, wooden bowls. I don’t know if it makes them taste better, but it sure seems to! You can get some of my favorites here. They are especially great if you are serving these at a Mexican themed party. I really hope that you will try this recipe out and be sure to let me know how it turns out in the comments below! Add the rinsed beans to a large pot with plenty of water, salt, and a small piece of onion. Let boil for about 1.5 hours, checking often to make sure that there is still enough water. Add the rinsed beans to a slow cooker with plenty of water, salt, and a small piece of onion. Turn the slow cooker on to high and heat for 3 hours. Add the bacon to a large pot and cook for about 5 minutes. Add the chorizo and continue cooking until cooked through. After about 5 minutes, add the ham, the beef franks, and the seasonings (including the garlic). Next, add the tomatoes, the cilantro, the onion, the jalapeno, and the chipotle pepper and cook for 5 additional minutes. Finally, add the cooked pinto beans and the water that they were cooked in and let boil for about 15 minutes so that all of the flavors can combine. If you want to thicken your charro beans, you can combine 2 tablespoons of corn starch with 1/4 cup of cold water and mix well before adding it to the pot. Serve hot as a side dish or on its own. Just made these today. They are delicious! Thanks so much for the recipe. So howe much of each seasonings should I put in?? Hi Anna – It really depends on your taste and how seasoned you want it. I usually add about 1-2 Teaspoons of each to start and then adjust from there. Hope that helps! You should be able to feed 4-6 people fairly easily with this recipe. Thanks! How long would I cook them in an instant pot? How much is a regular bag of beans? I made these today….very very delish. 3 hours on high in the crockpot. So you just use 1 lb bag of pinto beans? Hi Brianne – Yes, a one pound bag is correct. I just updated the recipe to specify 1-2 pounds of pinto beans. I usually use 1, but you can use two if you want extra beans. How much water do you use to cook the beans? Would this still be good if I used canned pinto beans to save a step? Or would they become mush? If so, how many 15oz cans would you recommend? Thx. Only if you don’t like beans! Cooking dried beans is incredibly easy. The only reason to ever use canned dried beans is in some circumstance like camping with lots of activity going on and no opportunity to really check the beans so that they don’t evaporate all the water out and burn. In that case, I personally would just cook something else that doesn’t require occasional attention over a period of time like beans. It looks to me like the amount of beans to use can vary as much as you want it to. Just adjust the other ingredient amounts to match. BTW, the weiners may be traditional, but I never encountered them in NE Mexico (Taumalipas, Nueva Leon). 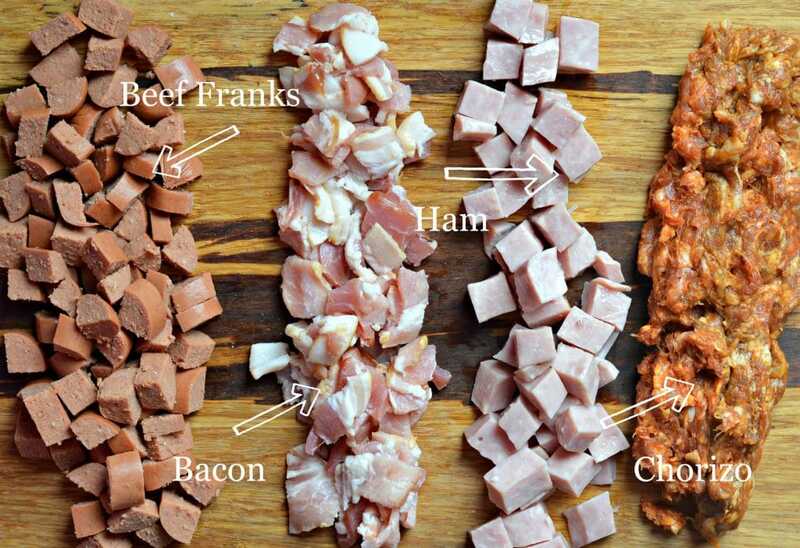 It was always bacon, ham, chorizo, and not necessarily all three at once. That varied, depending on the cook. Same in S Texas. Charro Beans are one of my favorite. I just tried this recipe and I can’t wait to try even more! This was sooooo good! I used bacon, about 8 slices! 1 chipotle. canned Rotel tomatoes and one fire roasted tomato can….. The best ever beans !!!! When cooking in Slow Cooker, when do you add the cooked meat and veggies? Hi Justine, the slow cooker method in the recipe is only for cooking the beans. However, I’m sure you could do the whole thing in the slow cooker if you would like to. In that case, you would want to cook the meats separately and then just add them to the slow cooker with the veggies when the beans are cooked already. Then you will probably just want to cook them on high for about 30-45 minutes before serving. Good luck. I have a question: I was going to make this dish for the refugee crisis center where I volunteer, but was told that the majority of our guests–many from Central America–do not like pinto beans. Can you comment on this? I don’t want to make the “wrong” thing. Thanks so much! Hi Annie! I can’t really speak for the people from Central America, but this dish is traditionally prepared with Pinto beans in Mexico, so that is how I would recommend that you make it 🙂 I can’t really think of anything else to replace it with, but I think they will like it. We do eat more black beans in Mexico than pinto, but for this dish, it is supposed to be made with pinto. Good luck! There is no reason the recipe could not be made with perona or with black beans. Since black beans are more common in southern Mexico, perhaps Central Americans might also be more willing to eat them. Pinto beans are rare in southern Mexico, at least in my experience, but common in northern Mexico.